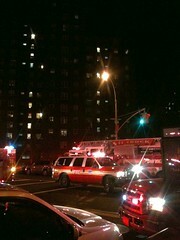 26 units and 84 firefighters rushed to a fire at the Jacob Riis Houses Saturday night. The blaze broke out shortly before 9:30 p.m. on the eighth floor of a 14-story high-rise at 108 Avenue D, near East Eighth Street, the fire department said. It was under control within half an hour, but not before one firefighter was sent to New York Presbyterian with minor injuries. The cause of the fire (the second in two days) was not immediately known.